The legend Chill Rob is back with a new E.P entitled “Chilled Not Frozen” and here is the 1st single featuring R.A. in top notch form. Loving everything about this. The clip is a straight to camera piece, but when you have 2 M.C’s firing like this, keep it simple stupid. Straight up heat!!!!! Get at the release here…. http://www.nobodybuysrecords.bigcartel.com which by the way is a dope site with some crazy releases from Phill Most Chill, A.G. plus more…. Enjoy! I want to first and foremost send massive props out to Robbie at Unkut.com who’s interviewed and shone extensive light on this album and the career of Chill Rob G. A lot of my own knowledge on this album comes directly from the work Robbie has done, that and my pal Lenny who put me on to this back in the early 2000’s. Since then i’ve done my own knowledge on Ride The Rhythm. I’ve hunted it down on Vinyl, CD and even stumbled upon a couple 12″s from it, needless to say it’s become one of my favorite late 80’s rap records. 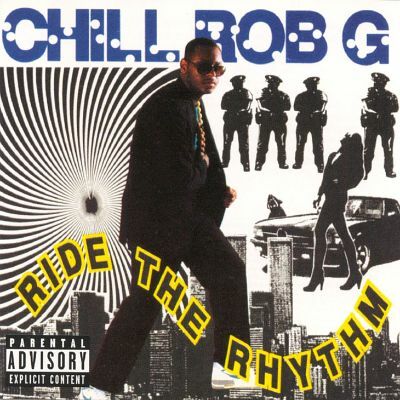 At this point in 2014 i think its a shame that albums like Chill Rob G’s 1989 debut Ride The Rhythm have gone largely by the wayside. You should consider for a minute the year this album dropped and all that means to rap music, the culture was still young. Paul’s Boutique, 3 Feet High And Rising, No One Can Do It Better, Unfinished Business, The Cactus Album, Ghetto Music, Its A Big Daddy Thing, Iceberg… Get it? Originality was paramount with every single release deserving of its own accolade and merit. Whether you were down with The Daisy Age or As Nasty As 2 Live Crew wanted you to be the music of Hip Hop was a burgeoning cultural movement that was still breaking new ground and defining itself as it had throughout the monolithic years of ’87 and ’88. Enter in to all this Ride The Rhythm. Expertly produced and crafted by Mark The 45 King, this album is a 101 lesson in breaks and rhymes and should be considered for any list on defining rap albums of the period. Chill Rob is a New Jersey native and was also a member of Mark the 45 King’s original Flavor Unit alongside Queen Latifah, Lakim Shabazz, Apachee, Latee and Lord Alibaski. Mark The 45 King would produce and see the release of this and the debut albums from Lakim Shabazz (who had killed 45 King’s “900 Number” a year or two prior) and Queen Latifah all in a two year period, impressive for even those highly productive days. Chill Rob G’s vocals are as commanding as Chuck D but maintain an almost Rakim like flow and preciseness. Check the title track. I love this joint and you might recognise the break which was later used on “Buck 50” from Ghostface’s Supreme Clientele. I think that the whole Snap jacking Chill Rob for their Euro trash pop hit “Power” has been covered elsewhere ad nauseam, to the point that almost all the info about this album pertains to those happenings. It would probably be remiss not to mention it here seeing that it is such a huge part of this album’s history, for those that don’t know here it is very briefly. Snap – a late 80’s / early 90’s European pop dance duo – sampled vocals from Rob’s song “Let The Words Flow” and neither Chill Rob nor Wild Pitch were too happy about it. 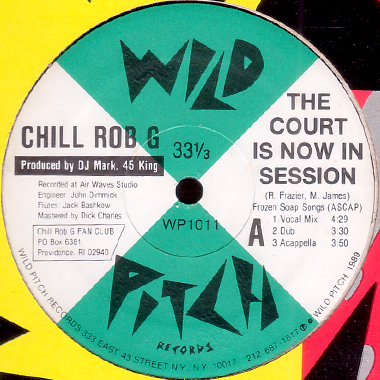 A deal was struck between the beefing parties that would see Chill Rob G record his own version of “The Power” over Snap’s music – with the blessing of Wild Pitch who clearly had dollar signs in their eyes. The results weren’t great, Snap had a worldwide hit when they replaced Rob’s vocals with another rapper (Turbo B??!) and Chill Rob didn’t… Have a worldwide hit that is. Here’s the video for it. I was actually aware of of one song off this album before i knew that i knew it. “Court Is Now In Session” was instantly recognisable to me when i first heard it, though i could never pinpoint where i’d heard it. The 45 King’s use of layered sampling is incredible particularly how he uses multiple records to construct a production that still seems to allow so much room to breathe. His use of Graham Central Station’s drum break from “The Jam” and what appears to be a little pitched up flute is crazy! On top of that, i own the 12″ of this and it contains accapellas of both Court Is Now In Session and Let The Words Flow which is the B-side… I like that kinda thing. Here’s the official video for Court Is Now In Session. As with most Wild Pitch Wednesday’s, the releases we focus on are definitely of their era and by that i mean that they sound and look distinctly of the point in time that they were released. While the cover art to Ride The Rhythm leaves a little to be desired – lets be honest, it’s kinda wack – the music this album contains is magnificent. This is the foundation to how Mark The 45 King would wind up producing mega-hits for Jay-Z and Eminem (“Hard Knock Life” and “Stan” respectively) among numerous others. This is also one of the pioneering Jersey records pre-Naughty By Nature and is regarded highly by the handful that know of it’s existence. Chill Rob G’s flow is an effortless barritone of rhythmic and quotable phrasing. Years after this album was released in ’99 Latin funksters Ozomatli teamed up with Cut Chemist and Chali 2na from Jurassic 5 for what was a moderately popular song at the time called “Cut Chemist Suite”, the reason i mention this is because Chali 2na’s chorus is a lyric lifted directly from The Chill One’s song Motivation, “I’m an aristocrat, ghetto diplomat and i’m blessed with the gift of rap”… Check it for yourself. Unfortunately Chill Rob didn’t make much more music following this album. He did show up on a European 12″ for a couple of verses in the mid 90’s from what i’ve read and may’ve even dropped something as late as 2008 but i haven’t heard it if he did, and to be honest i’m not sure i would’ve been checking for it if he had. I do love this album though and would recommend it to any fan with more than a passing interest in late 80’s hip hop, trust me on this one. “I might be chill but i’m not frozen…” Once again, that production combined with the flow and voice! The Future Shock.